As Singapore marks 50 years of national service (NS), all national servicemen - past and present - will be eligible for a free commemorative NS50 PAssion card. While this is a token of appreciation for their contributions, Defence Minister Ng Eng Hen said yesterday, "nothing can replace the hours that they have spent defending Singapore". 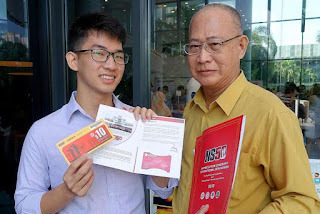 At separate appreciation ceremonies yesterday, Dr Ng, Home Affairs Minister K. Shanmugam and Second Minister for Defence Ong Ye Kung gave out NS50 recognition packages, including $100 in vouchers and also application instructions for the card. The ministers stressed the importance of NS, which has fulfilled Singapore's need for security since 1967 and allowed it to progress. "Without the SAF (and) NS to protect our sovereignty and way of life, there can be no progress," Dr Ng said at a ceremony in Toa Payoh. Without the SAF (and) NS to protect our sovereignty and way of life, there can be no progress. He was citing comments by the late founding Prime Minister Lee Kuan Yew at a 2012 meeting with Singapore Armed Forces (SAF) officers on how a strong SAF was needed to ensure Singapore's sustained security and economic future. The NS50 PAssion card offered by the People's Association (PA) comes with a five-year membership - which costs $10 to $12, depending on age profiles - and can be used at community clubs, Water Venture outlets and PAssion card merchants. Those with existing PAssion cards can still apply and use their cards concurrently. Separately, real estate giant CapitaLand yesterday unveiled various privileges for national servicemen. For instance, it will offer them an exchange of their NS50 vouchers for CapitaVouchers, which can be spent at more than 2,000 retail outlets across 17 malls here. More than one million men have served NS since 1967 in the SAF as well as in the police and civil defence forces, as part of the Home Team. Among the first to receive the NS50 packages were more than 500 national servicemen, including father-and-son pairs, who attended the ceremonies yesterday. Over these two months, the PA will be organising 52 ceremonies to hand out the packages. Many others will receive theirs by mail later this year. On the father-and-son pairs, Dr Ng said yesterday that the idea fits the NS50 theme, From My Generation To Yours. "It is a simple theme, my generation to yours. There can be no stronger representation of one generation to another than fathers and sons," he added. At a ceremony in Nee Soon, Mr Shanmugam, who is also Law Minister, said: "It is wonderful to see so many fathers who have gone through national service here, with so many of their sons who are going through national service, supported by so many mothers, wives, girlfriends and sisters." At a ceremony in Gambas, Mr Ong said the vouchers "are not just for the national servicemen, but for your whole family to enjoy, including wives and daughters". A common theme touched on by the ministers was how the entire society - including the family and grassroots organisations like the PA - plays a part in keeping Singapore safe and secure from threats like terrorism and cyber attacks. Noting how recent terror attacks in London, Stockholm and St Petersburg could also happen here, Dr Ng said: "It could happen tomorrow, it could happen years from now. When it happens, we must ask ourselves how Singaporeans will respond." Group internal audit manager Ho Chin Thiam, 60, who was in the first batch of police officer cadet trainees, received the NS50 recognition package yesterday, and said he would be using his vouchers at the HomeTeamNS clubhouses. "I feel honoured to receive this package, and that my contributions are recognised," he said.